We’d love your help. 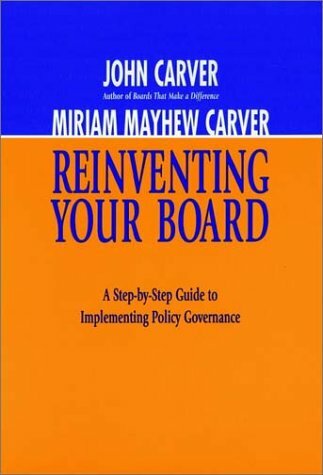 Let us know what’s wrong with this preview of Reinventing Your Board by John Carver. To ask other readers questions about Reinventing Your Board, please sign up. There are a lot of gems in here for board members and CSEs. I read this again as a review because a board I'm considering joining uses this model. It does not convince me that this model is particularly useful, but it's good to get every member of a board to agree to some governance model. A good guide for any organization that is looking to implement Carver's Policy Governance model.